George Strait and Texas businessman Tom Cusick today announced the fourth annual Vaqueros del Mar Invitational Golf Tournament and Auction raised a record $550,000. Over the four years of the event, more than $1.1 million has been raised to benefit military wounded in action. 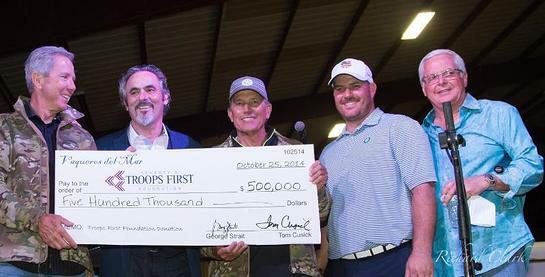 Hosted by Strait and Cusick at Tapatio Springs Hill Country Resort & Spa in Boerne, Texas, Saturday and Sunday, October 25 -26, the event benefits Feherty’s Troops First Foundation. The foundation provides meaningful assistance to military members who have been wounded serving in Iraq or Afghanistan. Strait and Cusick, who are joint owners of the resort with new partner Northview Hotel Group, created the fundraiser in November 2011 to support wounded U.S. servicemen and women. This year the event kicked off with a Western Gala and Live Auction Saturday night at Estancia at Thunder Valley, Cusick’s exclusive Texas hill country community near the Tapatio Springs Hill Country Resort & Spa. Entertainment was provided by the Josh Grider Band and Reckless Kelly followed by a live auction with Strait, Cusick and David Feherty on stage to encourage the crowd. The grand finale on Sunday included the golf “Shootout” with 10 teams vying for the grand prize custom-designed buckles followed by the Jam Session and Celebration party. Ray Benson and Asleep at the Wheel got the evening going with Jamey Johnson, Dean Dillon, and Keith Gattis joining in. The King of Country Music then joined his good friends in playing many of his favorite hits, a very rare opportunity as he just this year played his final “The Cowboy Rides Away Tour” date on June 7 with a record more than 104,000 fans in attendance. 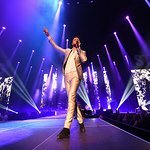 The current ACM and CMA entertainer of the year has more No. 1 singles than any artist and has had a Top 10 hit every year for 30 years.